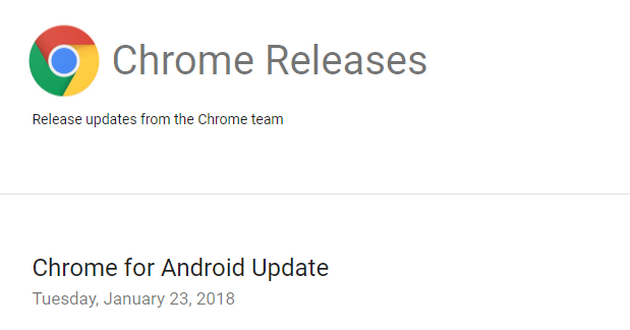 Google has announced the release of Chrome 64 for Android. The new browser version will be rolling out over the next few weeks on the Google Play Store. Google Chrome 64 for Android now prevents abusive advertisements from overtaking your device and giving you a bad user experience. Over the last few years, there has been a rise in the number of advertisements that cause the opening of new windows and tabs without the user’s permissions, often resulting in the reader having no idea where the content that was supposed to be reading has ended up. That’s a problem both for Google who wants to keep an honest advertising network rolling and the webmasters of these websites who want to keep the reader on their websites. Of all the advertising networks out there on the Web, Google is the one with the most money and subsequently the best security looking after it, so generally speaking, you don’t need to worry about the quality of ads coming from its network: they are good and trustworthy for the vast, vast majority of the time. But the next trick that allows advertisers to make money is always just around the corner—at least for a little while until it gets stopped. Over the years we have seen ads that redirect users to websites, resulting in loads of traffic. It’s a technique that has made some of the largest games what they are today: it’s how they grew, and if it weren’t for the benefit of essentially free advertising, they wouldn’t have had the capital to grow to anything close to what they eventually became. One example of such apps is Game of War—yes, that Game of War: the one that then went on to have people such as Kate Upton and Maria Carey in its advertisements. You probably have heard how its Super Bowl commercial back in 2015 made it take off and become what it is today, but little was heard of how it got there. Well before that Super Bowl it was using ad networks such as Technorati to make webpages redirect to its download page on the Google Play Store where millions and millions of people would then start playing. We know this because we watched it first hand . . . many of our readers at the time, including ourselves, were being redirected. Ad networks like Technorati were made aware of this issue as it developed but they weren’t able to actually patch it. The problem was one of the reasons why Technorati eventually sold to Synacor. The ad networks that applications such as game of War managed to take advantage of weren’t owned or operated by Google, and either are new ads that are making new windows and tabs open. The ads that Google is labeling as abusive today aren’t quite as sinister either: they aren’t getting ads served for free. But they are resulting in unexpected and unallowed windows and tabs being opened when the reader is supposed to still be on the same page . . . a trick that Google will now stop in its tracks, and it likely won’t see the light of day again by anyone now that they have had the security team sorting it out. The ads that have managed to take advantage of Google Chrome aren’t necessarily being served from Google advertising network, but they still have managed to come up with a solution for all ads coming from all networks and implement it in the Google Chrome web browser for Android. The abusive advertisements that Google has stopped were previously redirecting traffic without the reader requesting it. The ads were considered “scareware” and not containing anything malicious to worry about. The ads prevented the users from being able to read the webpages that they intended to read, and they would also often result in the inability to press the back button and end up on the old webpage then either, purposefully keeping the reader on the new webpage. The ads would result in more revenue going to the redirected webpages and not the webpages that the reader intended to read. Often the readers would blame the websites for this issue, without a proper understanding of how the advertisements are served and how little say the webmaster have in their role. One of the problems that Google has been facing of late is the fact that it will not allow many websites into its network as it aims at serving ads for high-quality websites only, and that resulted in lots of websites seeking ads from elsewhere. And there are many smaller ad networks in existence willing to take onboard that traffic, but they don’t have the money to be responsible ad networks and keep security tight. That has resulted in tricks such as these popping up without Google being able to do anything about it. Google now also owns the most popular web browsers: the portals to the internet so to speak. Google now can control some of these tricks that advertisers are creating on other ad networks, which is great for everyone who wants to keep reading articles on the web without the annoyance of ill-advised tabs and windows opening. You can find out the full list of changed made on Google Chrome 64 for Android from the Git log.